Here’s how the Auburn Tigers expose opponents on both ends of the floor. Will they continue to do so in the Final Four? That is what the Auburn Tigers have been during their 2019 NCAA Tournament run. The SEC program took down the top three winningest programs in college basketball history (Kansas, North Carolina, Kentucky) on its way to the Final Four. Auburn was able to make this incredible run with a barrage of 3 pointers, along with forcing opponents to turn the ball over. It’s hard to talk about the Auburn Tigers basketball team without discussing Jared Harper and Bryce Brown. With Chuma Okeke going down to injury in the Sweet Sixteen, much of the offensive load was going to fall on Brown and Harper. They delivered, combining for 50 points against Kentucky in the Elite Eight. Both are lightning quick and considered undersized for their position. Each can shoot it from deep and get to the rack. Much of what Auburn does offensively is designed to create space for them; often its via ball screens to free them up to make a play for themselves or a teammate. Below are two Ram sets Auburn ran against Kentucky to make the screener’s defender late on the ball screen defense. Click on a diagram to view full frame descriptions and download it to your FastDraw library. Auburn averages 9.3 steals per game, good enough for 3rd best in the country. The Tigers are also 6th in the country at opponent turnovers per game, creating 17.3 per contest (Stats from teamrankings.com). These steals and turnovers allow them to get into transition quickly and take advantage of a scrambling defense. Auburn generates these turnovers by making the offense uncomfortable. Bruce Pearl’s players apply strong ball pressure and have active hands. Tiger defenders do a great job of “chesting” a drive, and when the offense exposes the ball, swiping down on the ball without fouling. Off the ball, Auburn wants to make it difficult for opponents to get a clean catch. When opponents drive they do a great job of stunting or digging, as well as swiping with their inside hand and contesting a pass with their outside hand to get a deflection. Auburn hunts 3s within their offense and they seek to take them away on the defensive side. They want to force teams to take tough contested two’s. The goal is to be on the ball on the catch. When that does not happen, Auburn tries to run teams off of the line. 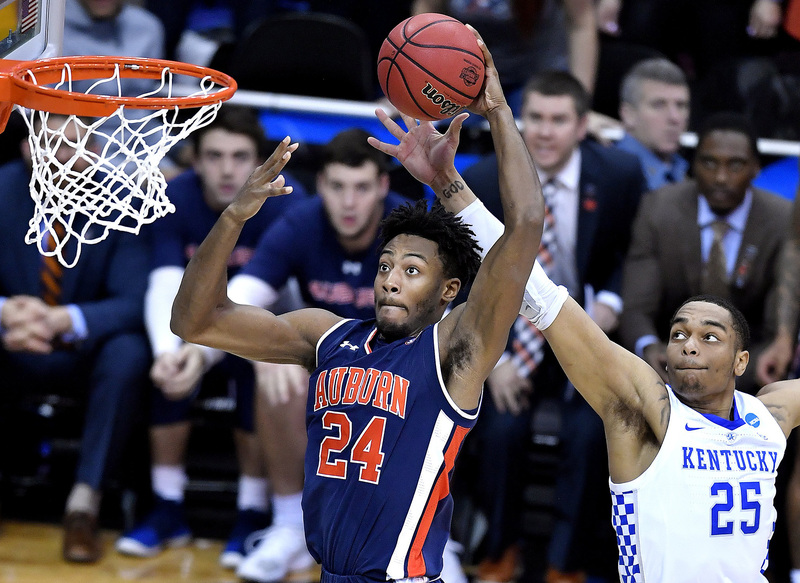 Look for Auburn to ride the combination of its explosive offense and pressure defense to potentially continue its terrific tournament run to the national championship game. For more Auburn Tigers sets on the PlayBank, click here!